Making the switch from a sedentary lifestyle to an active one can be difficult, especially at the beginning. Some people want to throw themselves in the deep end, hitting the gym five times a week right from the get-go. While that works for some people, it can also be a recipe for disaster for most. If you go too hard initially, there’s a chance you’ll turn yourself off from exercising at all. There’s a chance you’ll start viewing exercise as a chore, an all-or-nothing slog that you have to do in order to remain healthy. But exercise and fun aren’t mutually exclusive terms, and there are ways to introduce a light amount of exercise into your lifestyle while still having fun. Here are four “workouts” that don’t feel like you’re exercising. If you’re looking for a way to ease yourself into an active lifestyle, start here. If you want the perfect marriage between fun and light exercise, look no further than axe throwing. This fairly new sport, which often takes place in converted warehouses, involves players hurling axes at wooden targets. 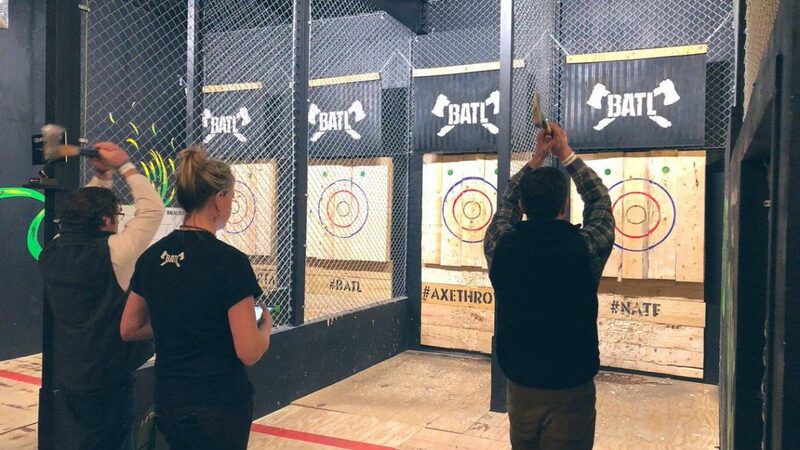 It might seem odd at first, but once you see how many people love axe throwing – including a number of celebrities and athletes – and how passionate people are about the sport, you’ll start to understand its appeal. Much like bowling, its bursts of energy promote muscle strength, balance and aim. When you think of sports involving exercise, bowling probably isn’t the first one that comes to mind. But while the sport doesn’t demand too much cardiovascular effort, the short bursts of musculoskeletal energy can help improve strength, balance and flexibility, making it perfect for anyone transitioning from a mostly sedentary lifestyle. By the third or fourth song, you’ve broken a sweat, but you don’t even notice because you’re having so much fun. That, if nothing else, is the case for getting your friends together and hitting the dance floor this weekend. The average person can burn an astounding 450 calories per hour by just getting out there and cutting a rug. Just make sure you don’t offset all that calorie loss with alcoholic drinks. Everyone’s aware of the health benefits of walking, but rather than simply walk a circuit, which can feel like humdrum work, why not have a little fun with it? Visit your town’s local sights, take in a walk through a famous nearby park, tour a historic part of town, and go on a short hike through the surrounding areas. Sightseeing requires you to be on your feet for an extended period, which offers a great (albeit gentle) cardiovascular workout. No one says you have to jump straight into Crossfit (or that you ever have to) in order to lead an active lifestyle. With these four, fun activities, you can reap the health benefits of light exercise without suffering the disappointment of overreaching.